It's April Fools' Day but this is no joke. This has got to be the best marinade. Ever. I've been crushing on mangos for a while now. It's flavor, it's smell, it's exotic origins. I'm even finding myself drawn to the color from a fashion standpoint too. I've been experimenting a lot with it and using it in it's simplest form just thrown on top of a spinach salad. 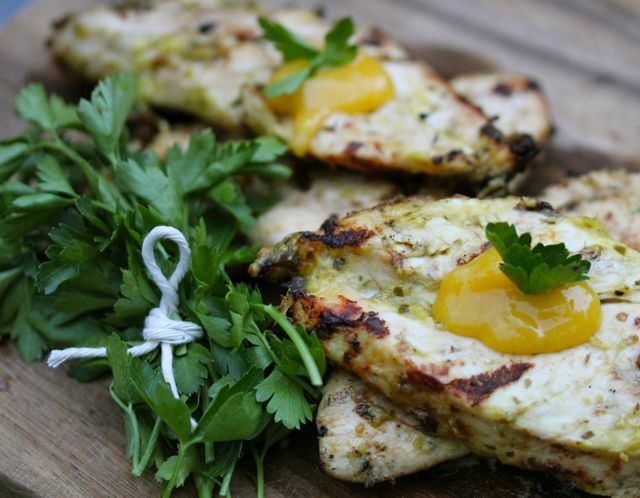 I created this marinade using some basic ingredients I had on hand. I must say, I even impressed myself on this one! We've eaten it twice this past week. Tonight we paired it with a Cuban style rice and beans by Seeds of Change. So, so, so very good. 1. In a food processor, puree mango to a smooth consistency. Add the juice of 1/2 a lemon and the next 3 ingredients. Blend ingredients. 2. In a shallow dish, pour marinade over chicken breasts and refridgerate for a minimum of one hour. If you try this recipe, let me know! Are you a fan of mango? What's your favorite way to enjoy this unique fruit? Enjoy your weekend and don't forget to visit again on Sunday for my fashion feature "Sunday Best." Yum!I might try this recipe this weekend. This looks like such a refreshing recipe! Great picture! Good morning from Hong Kong! Oooh that just sounds delicious! When we get home tomorrow, I know what ingredients are going straight into my grocery basket...along with a grill pan. Thanks for sharing this delightful looking dish!